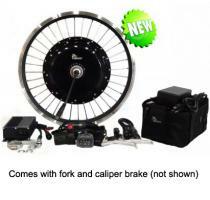 Electric Kit to convert 20" Front Wheel Worksman PORT-O-TRIKES to Electric versions. Kit includes fork with wheel installed and caliper brake to fit 20" Worksman Portotrikes ONLY USE THESE KITS WITH TRICYCLES THAT HAVE A REAR FOOT BRAKE. I have used an adult trike for years due to a disability. When I developed arthritis in my knee, biking became difficult and I was afraid I would damage my knee more. With this motor, we are back on the trail again! My husband is used to assembling things, so it was easy for my him to install. It was great for steeper inclines on the trail and did not hurt my knee. I still about pedal the same amount, but it is faster and easier. We just did a quick 6 miles and I could not see that it used even 25 % of the power yet. Looking forward to seeing how many miles we can go but I am guessing with me pedaling some, we can go at least 24 miles. This motor is expensive, but my bike was unused for over a year, so to be able to use it was absolutely awesome! I highly recommend it!!! There are no options for this item. Please ignore the green text below.